From all the staff here at Sofy.tv, we wanted to take this time to take our loyal members for all their support. The Sofy.tv revolution depends on your support. Without it, we would not be able to bring about the huge change in the feature short film industry that we started our platform to bring about. We believe that the short film industry can be brought back to life so that once again, it is a popular art form that is commercially viable for filmmakers. The commercial success of short films is key to helping short movie makers get access to the funds that will allow them to project their dreams onto the silver screen. Before we go any further, for the benefit of those of you who have not yet heard of Sofy.tv, here is a little on who we are and what we are about. Tired and frustrated about how hard it was to obtain sufficient funds for their short movies, a group of filmmakers at Largo Films decided that enough was enough. They set about coming up with a solution to the short film problem. The short film problem has been around for decades now. After audiences moved onto longer feature films, the short got left behind. As box office returns began to dwindle for shorts, so did the number of distribution channels (movie theatres). This naturally led to producers becoming less and less interested in funding short movies. And so the cycle of decline continued. While there have been some success stories in short film over the last 50 years or so, including the birth of the music video, cartoon/animation shorts, and in more recent times, some very high grossing short films, overall the picture has been grim. In one “Eureka” moment, the team at Largo Films envisioned a dedicated short film platform that would be the Netflix of short films. This platform could solve the short film problem in one go. It would allow filmmakers access to their audience, while also rewarding them financially for their hard work. These funds could then be used to help finance their next films. Added to that, filmmakers could also show a profit on their movies, meaning that professional producers who are looking to make solid returns on their investment can also be enticed back into the short film market. Short film enthusiasts will also benefit from access to more movies and the increased production values that come from filmmakers having access to more money. Added to this, they can now access all the top short films in one place, and anywhere in the world provided they have fast enough internet. Sofy.tv is a win, win platform for short filmmakers and short film lovers alike. Hence, we call our mission the Sofy.tv revolution. 6 Months Since The Sofy.tv Revolution Began. 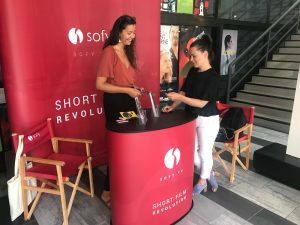 The official launch of Sofy.tv took place during this year’s Cannes Film Festival. At the time, we had a relatively small catalog of some 50 films. Since then our catalog has grown to over 300+ films and continues to expand by the day. Since all of these films are vetted for artistic quality by our Sofy.tv platform, we guarantee their quality. platform, which means you can’t see them anywhere else. We are doing our best to spread the word of the Sofy.tv revolution (it is a beautifully sunny summers day as I write this and I would most definitely be at the beach otherwise), we are happy to report that our membership numbers are growing healthily. A few weeks ago, we were happy to announce that “Short Film Streaming Site Sofy.tv Gets FIT Support”. Fit is a Swiss organization that provides a funding boost for startup companies that are deemed to be extremely promising. Well, Sofy.tv was one of the four companies that the organization recognized to show the most promise. We plan to use the funding to invest in our site’s exposure and our site’s revolutionary AI technology. filmmakers and film fans alike. One of the most exciting aspects to the Sofy.tv is one that our members never even realize is there. While our members love our site’s sleek user interface, it is what is underneath the hood which is most exciting. Our site is built on revolutionary new AI technology that has been developed specifically for Sofy.tv. Sofy.tv is developed in partnership with the Image and Visual Representation Lab at EPFL. This lab is part of one of the world’s leading technology universities and has already produced some truly innovative and cutting-edge technologies. The most exciting technology, a feature that is totally unique to Sofy.tv is our sophisticated AI film analysis tool. This tool analyses every single part of a film to create a detailed profile of the movie. This profile then allows our site to automatically categorize a film and then to match it to the most appropriate members. So, now’s a good time to use the pizza analogy. If our system discovers a new type of pizza, it will analyze exactly what kinds of ingredients it was made with so it can create a profile of that pizza. Now, the system keeps an eye on the exact (and we are not talking anything as vague as genres here) tastes of pizzas that our members are eating. So if a member shows a liking for a chicken on their pizza, for example, our system will recognize this and ensure that the pizza suggestions that appear on his/her own membership space are tailored towards chicken topped pizzas. This system is far more complex and sophisticated than the simple “by genre” model which is can only recommend food types, pizza, pasta, sushi etc. Sofy.tv is a platform crammed with great film and cutting-edge technology. We do all the work for you so that you can sit back and enjoy great movies. If you want to take part in the Sofy.tv revolution, head to our site to sign up now.